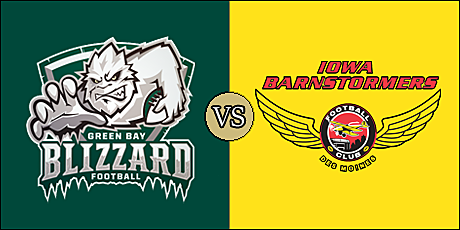 DES MOINES, IA - The Iowa Barnstormers scored just a single touchdown on the opening drive of their home opener against the Green Bay Blizzard tonight at Wells Fargo Arena tonight. As it turned out, that's all they would need. Daquan Neal's six-yard strike to Ryan Balentine 6:24 into the game put the Barnstormers up 6-0 (Nathan Criswell's point after try was no good). Iowa's smothering defense held the Blizzard to just three points on the night, and helped propel the Barnstormers to a 41-3 win over Green Bay in week 3. With the victory, the defending champion Barnstormers improved to 2-0 on the season. The Blizzard fell to 1-2 in the Indoor Football League standings. After Iowa's opening touchdown, Cody Barber scored what would be the Blizzard's only points of the game on a 33-yard field goal with 5:26 remaining in the first quarter. Iowa went up 13-3 at the 9:46 mark of the second quarter when Neal found Connor Hollenbeck for a two-yard touchdown. Criswell put the Barnstormers up 16-3 with a 24-yard field goal with just under three minutes left in the first half. There was no scoring in the third quarter, as both defenses proved to stiffen. Neal's five-yard touchdown pass to a leaping Samual Charles extended the lead to 22-3 not quite four minutes into the fourth quarter. They added to that on a 10-yard pass from Neal to Jamal Tyler and the Barnstormers' lead was 28-3 with 6:51 left in the quarter. Tyler scored on a four-yard run with just over a minute to go. The Blizzard were driving late in the game, but Lenorris Footman's pass to the left side of the field was intercepted by Jourdan Wickliffe and returned 49 yards for a score as time expired. The Barnstormers outgained the Blizzard in total offense, 248 yards to 166. That included a 157 yards to 92 advantage in the passing game. The Barnstormers' defense forced three turnovers; two interceptions and a fumble. The Blizzard were penalized 12 times for 71 yards, and the Barnstormers flagged six times for 51 yards. Neal, starting just his second game at quarterback for the Barnstormers, was solid. He completed 17 of 23 passes for 157 yards with four touchdowns, while rushing seven times for 32 yards. Tyler rushed 10 times for 33 yards and a touchdown and also caught a touchdown pass. Balentine led all receivers with nine yards for 87 yards and a score. Hollenbeck and Charles each added a touchdown grab to the Barnstormers' effort. In addition to his late interception return, Wickliffe tallied seven total tackles and two forced fumbles for Iowa Tyrell Pearson had an interception, and Reggie McGee forced and recovered a fumble. Just a week after being named IFL Offensive Player of the Week, Footman struggled tonight, hitting just seven of 26 passes for 92 yards and a pair of interceptions. He also rushed 12 times for 52 yards. Levi Copelin caught three balls for 46 yards and B.J. Hill had two grabs for 30 yards. Jadar Johnson posted seven total tackles and a tackle for loss for the Blizzard defense, and Truett Box forced and recovered a fumble. Both teams are on byes in week 4. The Barnstormers will visit the Nebraska Danger on March 23 with kickoff scheduled for 5:05 p.m. pacific (7:05 p.m. central). The Blizzard will travel to San Diego to take on the Strike force on March 24 with kickoff set for 3:05 p.m. pacific (5:05 p.m. central).